...and help us celebrate 15 years! 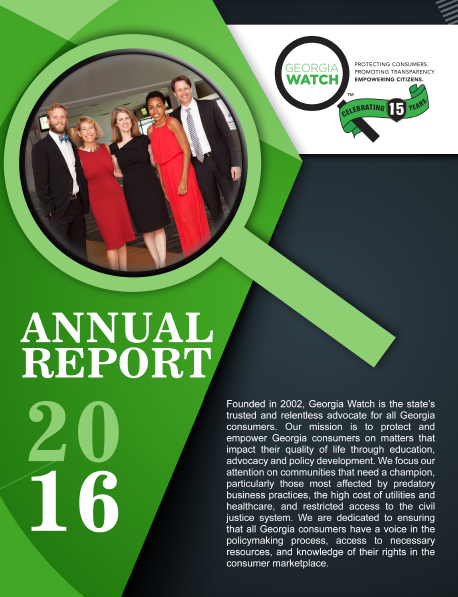 Georgia Watch is pleased to announce the release of our 2016 Annual Report. The report outlines our successes and program impact for the year, and importantly highlights our broad network of support from partners in healthcare, energy, civil justice and finance. We are truly grateful for our partners, friends and supporters and their dedication to putting consumers first. We invite you to read through the Annual Report and share in our hard-earned successes for consumers across the State of Georgia in 2016. 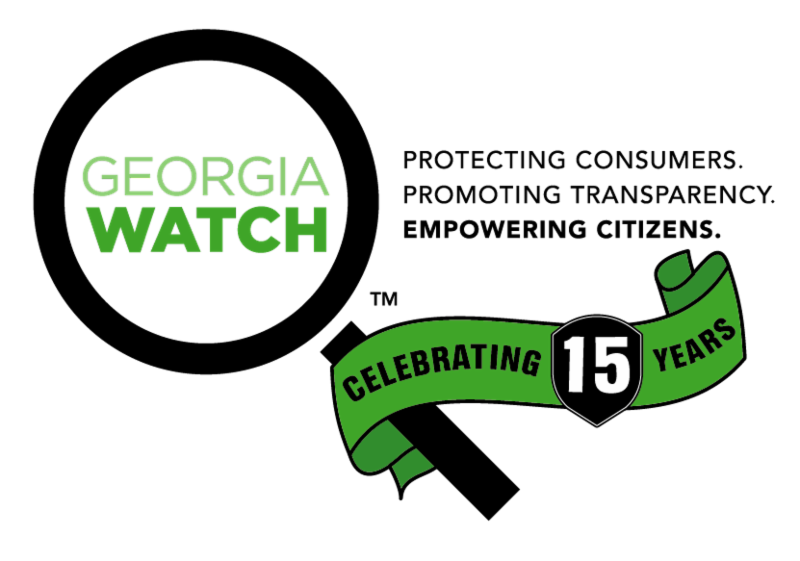 Since 2002, Georgia Watch has been your trusted and relentless advocate, working every day to make Georgia a model for consumer protection. Watch Clark Howard's video to see why he supports Georgia Watch, and h elp us reach our goal of raising $15,000 in honor of our 15th Anniversary with a donation today! Why do you support Georgia Watch? Please tell us here. Georgia Watch and Energy Efficiency for All partners are hosting an Energy Equity Forum in Camilla, Georgia on October 7th at the Southwest Georgia Regional Commission. 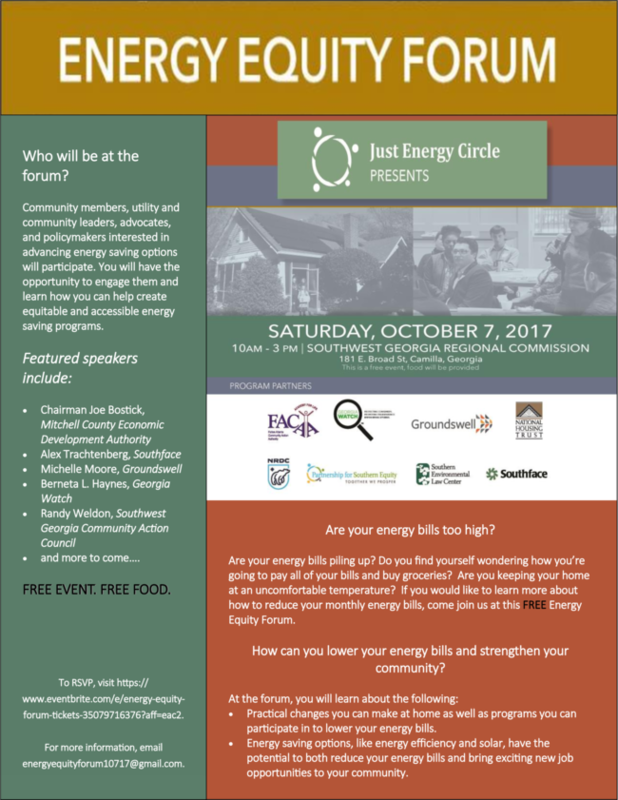 The free forum will bring together community members, utility and community leaders, advocates and policymakers to discuss how to reduce energy bills and make solar and energy efficiency more accessible to southwest Georgians. If you are a community member or leader who lives in or around Camilla, please join us! Space is limited , so RSVP now! Learn more and RSVP here . Georgia Watch recently received a grant from Kaiser Permanente of Georgia to support our Promoting Access to Care initiatives, including our work to educate consumers and service providers with our Georgia Consumer Guide for Medical Bills and Debt. We are grateful and honored to receive support for our work once again from Kaiser Permanente of Georgia. Georgia Watch has been selected for a Tier III Pipeline to Proposal award from the Patient Centered Outcomes Research Institute (PCORI). This is the third PCORI award Georgia Watch has received. During Tier I and Tier II, Georgia Watch successfully built a partnership with a multitude of stakeholders to explore future research that will examine healthcare delivery in rural Georgia communities. During Tier III, the partnership will focus on putting together a research proposal that may explore care provided by advanced practice registered nurses, telehealth technology, or school-based clinics. To find out more about this project, visit the project online at www.georgiawatch.org/PCORI. Please plan to join Georgia Watch for our Annual Consumer Champion Awards and 15th Anniversary Celebration on October 10, 2017 at the home of Governor and Mrs. Roy E. Barnes. So if Plant Vogtle is scrapped, do people get their money back? Was your home damaged in a storm? A drone could help you.